Australia's native plants are capable of thriving in a diverse range of climates, from the arid, inhospitable Western Australia to wet, boggy riverbed environments. Native flowers often feed birds and animals. Some might look familiar, since they have spread beyond their country or origin either as favorite tropical flowers from the florist or cultivated shrubs. 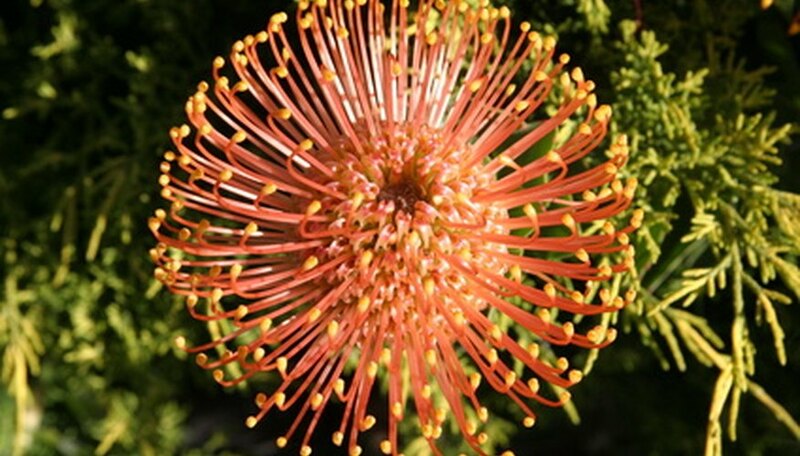 Banksia flowers are related to the waratah; both belong to the Protea family. Australian aboriginals used banksia flowers for their nectar. Western Australia contains the largest concentration of banksia flowers, but these plants can be found over all parts of the country. Banksia flowers are conical and contain many small, fluorescent flower spikes. At the top of the flower spikes rests a bright yellow pad of pollen. While bottlebrush (Callistemon) is cultivated widely outside of Australia, this flowering tree is native to the country. Bottlebrush trees get their name from the flower clusters, containing long, feathery fronds that resemble a bottle brush. The flowers can be yellow, red, pink, purple or green. These trees prefer moist, boggy environments. They bloom from October to December, in Australia's spring months. This Australian native resembles a colorful artichoke, with large flower bracts surrounding an oval-shaped flower head composed of lots of small petals. The waratah (Telopea speciosissima) is a florist's favorite tropical flower and should look familiar to those visiting Australia. The waratah has no fragrance. Its leaves are glossy and dark green. Oval in shape, the edges are lined with sharp teeth. This plant prefers dry environments and dislikes areas with heavy rainfall. In 1962, waratah became the official floral emblem of the Australian state of New South Wales. Emu bush (Eremophila) enjoys the tropical climates of Australia and the South Pacific islands and can be found in every Australian state. This plant features colorful fuchsia flowers that develop fruits. The tube-shape flowers contain nectar and frequently attract birds. Erroneously believed to be eaten by the emu, the fruits are nonetheless consumed by other animals and birds. Emu bushes grow in arid environments, largely in Western Australia. Australia has more than 1,000 species of native daisy (Asteraceae), according to the Australian Native Plants Society. These native daisies include flowers, herbs, shrubs, annuals and biennial flowers. While they do best in well-draining, acidic soils, the plant can thrive even in sandy soils. Australian daisies enjoy diverse growing environments; some prefer full sun and others shade. Are Christmas Cactus Plants Poisonous to Cats?